NetGiant's business model relies heavily on traffic and conversions driven from search marketing campaigns. Its online retail business demands efficiencies at every level and the company is always looking for ways to evolve its search marketing strategy to gain the best return. 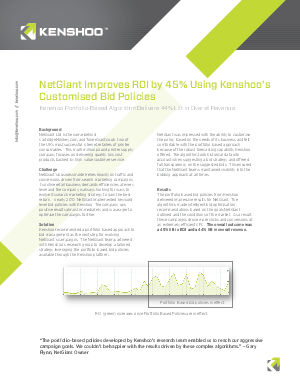 In early 2010, NetGiant implemented keyword level bid policies with Kenshoo. The company saw positive results almost immediately and was eager to optimise the campaigns further.